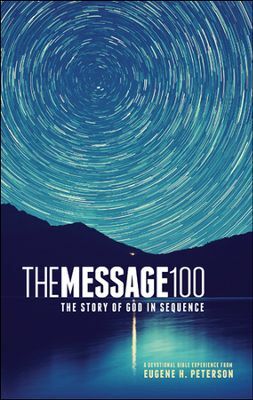 The Message100: The Story of God in Sequence, published by NAV Press, With Tyndale Publishing, is a Bible that seeks to carry its reader through the Word of God as it is divided into 100 messages. This Bible is designed to, while containing the entire Word of God, move its reader through the unfolding story of scripture. It is designed to be utilized by a student of the Word at any level, from beginner to the highly educated Biblical scholar. Each of the 100 readings begins with a brief reflection from Eugene Peterson, which is meant to orient the reader towards what they need to know about the letter that they are about to read. Each letter has been given a title; for example, section or letter number 018 is entitled In This Present Moment. Each of the letters is placed with a specific section, under a specific title. While this Bible does not contain the “Norms” found in the average Bible, it does present the Message in a very powerful, unique manner. Thus it is a recommended purchase for personal study or as a gift for someone wanting a greater understanding of God’s Word. NKJV Foundation Study Bible: Build Your Life On It, published by Thomas Nelson, is a bible that seeks to provide each person utilizing it a foundation for their time spent studying the Bible. 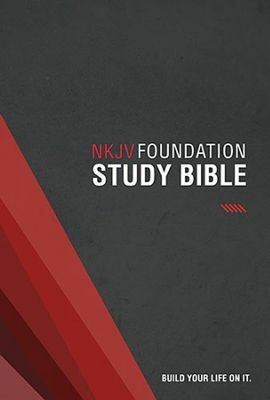 This NKJV Foundation Study Bible is uniquely designed for the beginning Bible student, but it also contains enough materials and information to provide even a seasoned Bible student the opportunity to grow closer to God, through the study of His Word. The NKJV text is based on the King James Version of the Bible, thus it is backed by historical accuracy and unparalleled accuracy in translation. It is also jammed from cover to cover with a substantial amount of study aids. It contains concise study notes, theological notes, NKJV translators’ footnotes, in text subject headings, cross references, a concordance and a numerous full color maps. One thing that sets this apart from many Bibles is the fact that it is a Red Letter Edition. This is an important aspect, especially for a student of the Bible, as it offers certainty as to which words are the ones spoken by Jesus. This is an amazing Bible, ready to be utilized to enhance the life of any Christian ready to turns its pages and receive its knowledge. Thus it is a highly recommended purchase.